Rules standardization for Battletech games in games run by Charles "IronSphinx" Wilson at AFK Games. 1/2-hexes and 1/4-hexes are to be treated like full-sized hexes for purposes of gameplay. Note: If there is any question about the disposition of the underlying terrain, then the GameMaster will have sole discretion for deciding what said terrain is (if the "majority terrain" rule doesn't resolve the disposition of said hex). While I may add special rules that are specific to the scenario, these rules are what players can expect to be used in every game that I run. Please take the time to review said rules and bring any and all questions to the GameMaster "before" the game begins. In future games, I will bring a copy of these rules for quick reference. All other rules found in the Advanced Options will be implemented on a case-by-case basis depending on whether or not they are applicable to the scenario or units. 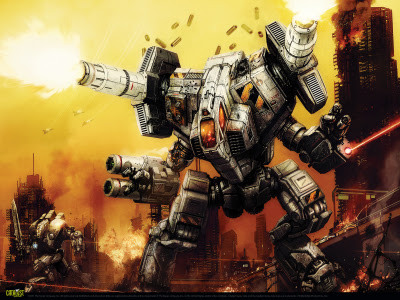 Bipedal BattleMechs can torso twist one hex facing left or right, Quad ‘Mechs cannot. Instead of rolling one set of dice for to-hit rolls, players roll a set of dice for each damage point their unit does at the range for the specified attack. Exa: if I'm making a short range attack and my unit does 3 points of damage at short range, then I roll three sets of six sided dice. If at least one shot from a unit's attack hits the rear of the target, apply one additional point of damage as per standard Alpha Strike rules--multiple hits to the rear from the same unit's attack do not confer additional points. Exa: I make a short range attack at the rear of my target. My 'Mech does 3 points of damage at short range. I roll three sets of six sided dice and two successfully hit the target. The target takes three points of damage: one for each successful attack and one for striking the target from the rear. Physical attacks still only require one 2D6 dice roll and apply all damage to target. Critical hits follow the rules on page 42 - "if a critical hit does not apply to the unit in question, apply 1 additional point of damage to the unit instead, but do not roll for additional critical hits as a result of this extra damage." However, when multiple dice rolls are used for each ranged attack, only one critical hit will be rolled on the target unit per attacking unit regardless of how many successful hits on internal structure were made. Exa: My Bushwacker rolls three sets of dice for an attack on a Stalker. Two of those hits are successful and both damage internal structure. I then roll one critical hit chance, even though I did two points of damage to the Stalker's internal structure. When making an attack, units that do more than one point of damage at the designated range for their attack may split their attacks between two targets within their firing arc (and only two targets). Primary target roll number is calculated as per normal rules however, the secondary target roll number receives a +1 to-hit modifier. Exa: 'Mech does 4 damage at short range. Player decides to do a three-point attack at the primary target within short range and a one point attack to a target also within short range. Attacks can be made against a single secondary target at a different range bracket. Start with the lowest damage range bracket and make that attack, any range brackets with damage values higher than this number may make a secondary attack with a damage value equal to the excess attack damage in that more damaging range bracket. Exa: 'Mech does 4 damage at short range and two damage at medium range. Player declares the medium range target as the primary and short range target as the secondary target. This means the medium range attack has two points of damage and the short range attack has two points of damage. When making an attack against a secondary target, the amount of damage per attack per target must be stated before the attack is made. Exa: using in the above example, I must state 3 points against the primary target and 1 point against the secondary target, before rolling the attacks. Any unit that makes a secondary attack has to do so as it fires. It may not come back later in the turn and make a secondary attack. Units may not split physical attacks between multiple targets. Nor may units split damage from artillery attacks in this manner. Physical attacks and Artillery strikes always follow the rules as stated in the Alpha Strike rulebook.